What part of the family did these genes come from?! Majandra Delfino (ABC Family’s State of Georgia) has been cast to play Dwight Schrute’s (Rainn Wilson) sister on The Office spinoff project, which will be introduced in an episode of the NBC comedy later later this season. 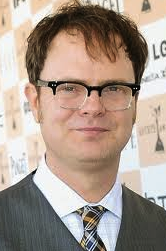 Titled The Farm, the spinoff has Dwight living at the Schrute family beet farm and bed & breakfast. Delfino will play Fannie Schrute, Dwight’s younger sister who once fled the Schrute farm life for Boston but is back, divorced and with a child. The Farm was conceived by Wilson and former Office executive producer/showrunner Paul Lieberstein.